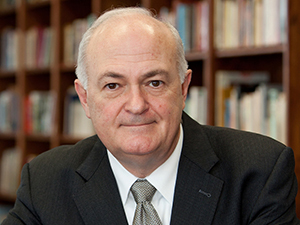 President Emeritus Steven Knapp to receive an honorary degree at the May 20 ceremony. The George Washington University is counting down to Commencement with less than six weeks to go before the weeklong celebration. GW is the only university to hold its graduation on the National Mall. In addition to the all-university May 20 ceremony, individual schools and colleges will hold celebrations during Commencement week, which begins May 15. The university also hosts a Senior Class Toast and Interfaith Baccalaureate service during the week. The university announced Monday that Steven Knapp, president emeritus and university professor of English, will receive an honorary Doctor of Letters at the university-wide ceremony. Dr. Knapp served as president of the university from 2007 to 2017. During his 10 years of leadership, Dr. Knapp catalyzed the university’s growth as a world-class research institution, overseeing the planning for Science and Engineering Hall and fostering interdisciplinary initiatives, such as the GW Cancer Center. He oversaw a significant increase in student public and community service and expanded access to a GW education to students from all backgrounds. Dr. Knapp was instrumental in making the university a hub for the arts with the addition of the Corcoran School of the Arts and Design and creation of the George Washington University Museum and The Textile Museum. In addition, Dr. Knapp set the university on a course to become a model of urban sustainability through efforts such as the innovative Capital Partners Solar Project, a unique collaboration between GW, the George Washington University Hospital and American University. He also launched the university’s most ambitious fundraising campaign ever, Making History: The Campaign for GW, which raised more than $1 billion to support students, enhance academics and break new ground. President of the National Academy of Sciences and renowned geophysicist Marcia McNutt will deliver the 2018 Commencement address at the May 20 ceremony. Dr. McNutt was elected president of the NAS—the United States government’s top science advisory organization—in 2016, becoming the first woman to hold the position. At the NAS, she has focused on improving ethics in science and promoting women in the field. Prior to her role as president, she served as editor-in-chief of the prestigious Science family of journals. Olympic medalist Elana Meyers Taylor, B.S. ’06, M.T.A. ’11, will also be awarded an honorary degree. Ms. Meyers Taylor is a three-time Olympic medalist and former standout Colonial softball player. Most recently, she received a silver medal for women’s bobsled at the 2018 Winter Olympics in Pyeongchang. The then-Ms. Meyers arrived at GW in 2003 as the softball program's first recruit and over four years became one of GW’s most decorated student athletes. The Georgia native was twice an Atlantic 10 Student-Athlete of the Year and Capital One/Sports Information Directors of America Academic All-American during her career at GW. A complete schedule of Commencement events is here. The university is also hiring students to greet and assist Commencement guests. Students can apply here. The B.A. candidate in international affairs will speak on opening the doors to opportunity.